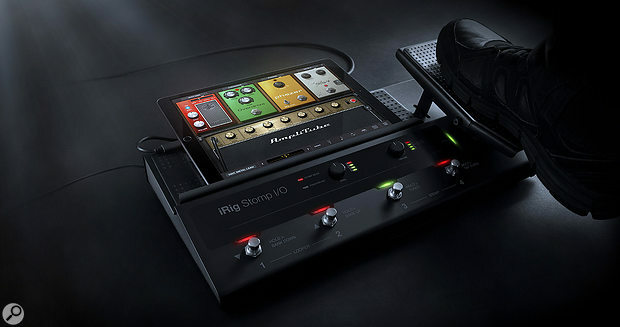 The iRig Stomp is not a new name in the IK Multimedia universe, but this latest family member aims to give users of mobile devices the experience of playing with dedicated hardware by providing plug‑and‑play integration with AmpliTube (iOS/Mac/PC) and VocaLive (iOS). To this end, the robust floor unit combines a 96kHz/24‑bit audio interface with MIDI I/O, along with a docking slot that can accept an iPhone, iPad (including the 12‑inch iPad Pro) or Microsoft Surface — plus there’s the option of USB connection for a Mac or Windows PC. Mini‑DIN/Lightning and USB cables are included. 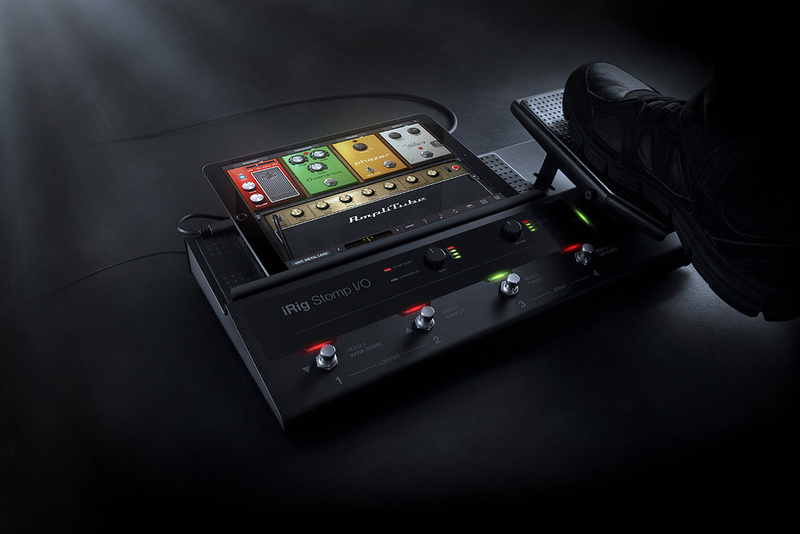 The iRig Stomp I/O comes with a generous bundle of guitar and vocal processing software, as well as recording software, and has a place in home recording as well as on stage. Unlike most hardware processors, though, the software runs on the mobile device (or connected computer) and so can easily be updated. You also get a much larger screen area than a typical hardware box, which is always welcome. Power comes from an included power adaptor, but if used with a computer, the hardware can also be powered directly from USB. The metal floor unit has an expression/controller pedal on the right for volume, wah and so on, and four large footswitches for navigating presets, turning on the tuner or for entering tap tempo, all with LED status lights that show either green or red. The footswitches may also be used to control the looper when the app features one. Sockets are fitted for the connection of two external switches or pedals and, as the hardware has MIDI I/O, it can also be used as a stand‑alone MIDI controller for other applications. A combi‑XLR/jack input can take instrument or mic‑level signals and includes switchable 48 Volt phantom power. At the output, there are balanced stereo jacks that may also be used unbalanced, plus a quarter‑inch TRS phones jack. Input gain and output volume are controlled by dedicated front‑panel knobs accompanied by bargraph level meters. A long slot with a rubbery grip material holds the phone or tablet in place at a practical angle for viewing and keeps it well away from the footswitches. If you prefer to put your tablet on a desk or mic stand platform, an extension cable works fine. When connected, the mobile device charges during operation. For live use the optional iRig Stomp I/O travel bag sounds like a good idea. The bundled IK software, if bought separately, would cost rather more than the iRig Stomp I/O itself, so the complete package is something of a bargain. 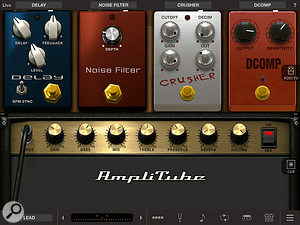 You get AmpliTube 4 Deluxe for guitar amp and effects modelling comprising over 140 gear models for Mac/PC and 70 for iOS. Acoustic guitarists can run the included AmpliTube Acoustic for iOS, while vocalists get VocaLive iOS to provide full control over vocal effects without having to rely on a mix engineer. For recording there’s also Mic Room and four processors from the T‑RackS 5 mixing and mastering suite: White 2A, Black 76, VC‑670 (compressors), plus the EQP‑1A equaliser. There’s also a copy of Ableton Live 9 Lite for Mac or PC. I found that with the latest iOS on an iPad, it is necessary to ensure that the iPad’s Privacy settings allow AmpliTube or your other IK Multimedia apps to access the microphone, otherwise you’ll find you’re not getting any sound. Once that’s done it all works pretty much out of the box. As a straightforward audio interface for a Mac or PC, the iRig Stomp I/O shows up as a class‑compliant device with one input and a stereo output, so no additional drivers are needed. The audio path is creditably quiet and clean whether using a mic or an instrument and those amp and pedal models run with extremely low latency, so the sensation is pretty much like playing through dedicated hardware. You can set the footswitches either to Stomp mode, using them to turn four stompboxes on or off, or to switch between presets and banks. One word of caution though: if you’re working only on headphones, there is probably no ground connection to any part of the system and so some louder‑than‑expected guitar buzz might become audible. This is also a common problem with laptop studios that don’t have a mains ground connection, so plugging one or both of the output jacks into a piece of audio gear, such as a mixer or monitor that is grounded, will fix the issue. If you’re happy with the sound of IK Multimedia’s software, the iRig Stomp I/O is the ideal way to take it on the road with the convenience, audio quality and controllability of a hardware device. Having the large colour screen of a tablet always helps and the way the panel is set out makes it very unlikely that you’ll put your boot through your tablet or phone. It can also double as a stand‑alone computer audio interface or MIDI controller and in the studio it can act as an amp modeller and/or effects rack. IK have worked hard to ensure the best possible integration between the Stomp I/O hardware and their apps, so that even AmpliTube Free works seamlessly. There’s a lot to like here for a very modest outlay. Doubles as an audio interface and MIDI controller. Comes with a very generous bundle of IK Multimedia software. Nothing to dislike unless you have an aversion to relying on a mobile device when playing live. 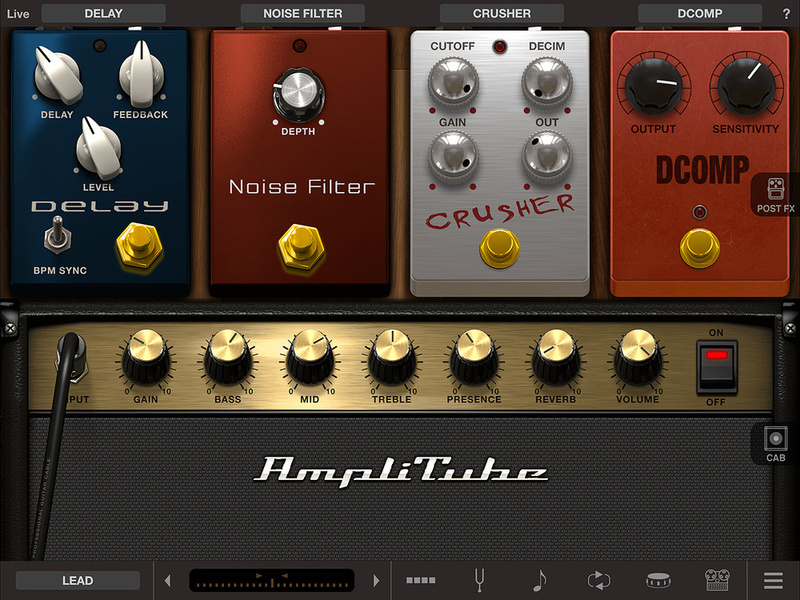 A practical means of taking app-based effects and amp modelling into the hardware world.